On Saturday, March 26th, at the world famous Turner Hall Ballroom, WMSE will once again deliver an incredible night of music by presenting a who’s who of the MKE punk scene. 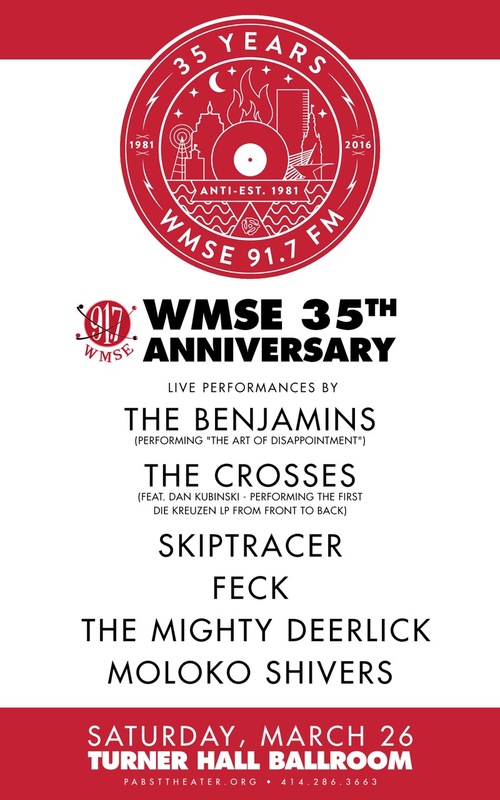 The aptly titled event “Never Mind The Reunions, It’s WMSE” points out, in a cheeky way, that these bands always had and will have a home on the airwaves of WMSE. The all-star punk lineup includes: Moloko Shivers, The Mighty Deerlick, Feck, Skiptracer, The Crosses, and The Benjamins. The Crosses, featuring Die Kreuzen singer Dan Kubinski and his band, will play the entire first Die Kreuzen LP from start to finish. Capping off the night will be The Benjamins, in honor of the 15th anniversary of The Art of Disappointment, the softest band in Milwaukee will play their classic (and only) album from start to finish. – WMSE Station Manager Tom Crawford. Tickets are only $15 and can be purchased here!